I usually try to keep up with the Vogel Prize, because it’s been a great predictor of fine writing over the years, with winners like Tim Winton, Kate Grenville, Gillian Mears and Brian Castro, and more recently Christine Piper (After Darkness) and Rohan Wilson (The Roving Party) amongst others. This year, however, the award takes me out of my comfort zone because it was awarded for only the second time ever, to a collection of short stories (and as you all know, I prefer my fiction in the form of the novel). 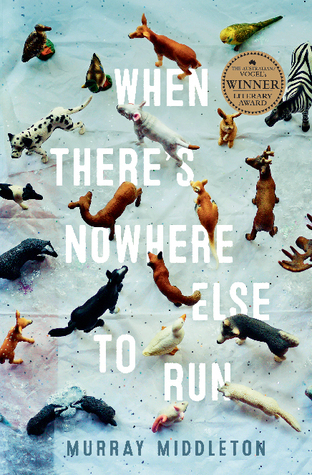 As it happens, reading the winning collection, Murray Middleton’s When There’s Nowhere Else to Run coincides with reading a collection called Family Room by Indonesian author Lily Yulianti Farid – because I’m going to be ‘in conversation’ with Lily at the Bendigo Writers’ Festival in August. The contrast between these two collections couldn’t be greater, because (as you will see when I finish reading Lily’s book and write my review) she is wrestling with the remarkable social and political changes of the post-Suharto era while also interrogating feminist issues in a patriarchal society. The quiet, reflective tone of Middleton’s book seems to lack passion and energy by comparison but that may be the appeal for some readers. And yet, it’s an interesting collection. In settings from Perth to the eastern seaboard, his stories focus on people whose lives are falling apart. It’s a pessimistic view of the world because these people all seem to be trapped by their circumstances, with ‘nowhere else to run’. One which tore at my heartstrings was ‘Mainstream’, in which the mother of an autistic son has had enough and wants to offload the stress of caring for a child with a disability. Another that indirectly gives voice to a traumatised survivor of the Black Saturday bushfires is a poignant study of an adolescent’s struggle to empathise because he is preoccupied with the normal life of a teenager (and especially his first girlfriend) and – as you’d expect with a boy of his age – he’s out of his depth in dealing with grief and trauma. I sometimes heard Mum and Dad talking about Raymond in their bedroom at night. They never argued. I could tell they were talking about him because their conversations were in a different pitch than usual. It was a strange thing. When I heard them talking, I realised how little trouble I must have given them over the years. I couldn’t say whether Raymond overheard their conversations from the study, or if he did, whether he cared. I figured that our aim was to help him feel normal again. I had no idea what constituted ‘normal’. Before I met Courtney, I thought that I was painfully normal. I wondered whether Raymond had been normal before he moved to Marysville, with all that sugar swimming through his veins. All I concluded was that once the state was lost, whatever it was, it probably became impossible to find again. Not all the stories are entirely successful. ‘The Last Trout that Richard Bought for Alice’ tries to capture the sense of panic felt by a hit-run driver, but IMO it doesn’t quite work. The prose is too calm and measured, the narrator’s language too coherent to be convincing. On the other hand Middleton’s economical style of writing suits ‘Forget about the Prices’, a clever rendering of the awkward and stilted conversation between a mother and her son, a Vietnam veteran and heroin addict. He was surprised to hear someone knocking on the front door. It was never locked. No one had even given him a house key. When he answered the door he saw his mother standing on the tatami mat that he’d bought at the local market. She looked much older than the last time he’d seen her. It was the skin around her eyes. He wasn’t sure how she’d managed to find him. The only postcard he’d sent was from a sugarcane town several months ago, at the end of the harvest, when he had already booked his next train ticket. He led her through the weatherboard house to the back porch, where he had been filing his nails. She sat on a wicker couch opposite him and surveyed his Crazy Clark’s uniform on the clothesline. It was late in the afternoon. Shadows were creeping across the vegetable garden towards the bungalow where he slept. ‘This humidity is something else,’ she said, trying to air out her stiff denim vest, which made her look a bit silly. It was nice to hear her voice though. The anonymous reviewer LS at The Saturday Paper acknowledged that there’s some clunkiness in Middleton’s writing but admires the sincerity and heart evident in these stories . James MacNamara at The Australian thinks that Middleton is a major talent influenced by Hemingway’s iceberg style — economical prose that hints rather than states. It will be interesting to see what Middleton comes up with next. PS I should mention that Allen and Unwin deserve bouquets for supporting this prize for young writers by publishing the winning novel. This kind of really meaningful support is probably something beyond the reach of small publishers though I know of two who do: Text supports a prize for YA and Children’s books and the Seizure Prize is a publishing deal. (It was won in 2014 by Julie Proudfoot with her impressive novel The Neighbour.) But I wonder if other major publishers like Penguin/Random House offer publishing deals as a prize for debut Australian writing?